Submission from the Topić case (heard 16/1/2019) has been translated for us by one who can speak Croatian. Topić “has a deadline of 30 days to reply,” the translator noted. This should, in our humble opinion, be obligatory reading for all EPO insiders. It helps to know who one’s boss was. The lawlessness at the EPO may then seem symbiotic. A lot of information was suppressed by Team Battistelli, which had chosen to give this man millions of euros (or at least a million euros in salaries and bonuses). His contract was renewed/extended in spite of all the scandals. Battistelli himself, helped by the supine Administrative Council, was absolutely fine with this person. The Defendant-Counter-Prosecutor responds to the submission of the Prosecutor-Counter-Defendant dated 28.11.2018. The aforementioned submission is entirely incorrect, without reference to any material provision. The Prosecutor-Counter-Defendant’s claim – that the he was not a party to the proceedings stated by the Defendant-Counter-Prosecutor – is incorrect. A private penal litigation for defamation, substantially identical to this civil litigation (in addition to the discrimination against the Defendant-Counter-Prosecutor), in which the Prosecutor-Counter-Defendant and Defendant-Counter-Prosecutor are the parties in this litigation, with the final decision in favor of the Defendant-Counter-Prosecutor, which is attached to this file (pages 70-134), along with the documentation of the above-mentioned private penal litigation, which was continuously monitored by the English “Techrights” portal (pages 146-159 of the file), which denies the allegations of the Prosecutor-Counter-Defendant. The aforementioned is not the only private penal litigation for defamation in which the Defendant-Counter-Prosecutor and the Prosecutor-Counter-Defendant are the parties in the litigation (pages 37-45 and 232-278 of the file); where after 6 verdicts and the false testimony of Ms. Romana Matanovac Vučković, the former deputy of the Prosecutor-Counter-Defendant, the litigation was finalized against the Defendant-Counter-Prosecutor. It was the so-called: The “defamatory version of the dismissal”, which the Defendant-Counter-Prosecutor so called because of the gross untruths secretly filed with the Croatian Government about her by the Prosecutor-Counter-Defendant. The Prosecutor-Counter-Defendant’s letter dated 19. 2. 2008 (pages 37 and 232) was sent to the Government of the Republic of Croatia, which the Defendant-Counter-Prosecutor accidentally found out about a year and three months after the “official version of the dismissal” (pages 36 and 187). The Prosecutor-Counter-Defendant not only hid this letter from the Defendant-Counter-Prosecutor, but he did not provide it to her despite her request for it (page 409, 416 files, letter dated 11.5.2009, lawsuit dated 12.11.2009), which is contrary to Article 10, paragraph 1, clause 4 of the on Access to Information Act (OG 172/03), which is punishable by Article 26 of the same Act, and the Defendant-Counter-Prosecutor, having received the letter from the Government of the Republic of Croatia on 2.7.2009, initiated on the 1.10.2009, a private penal lawsuit for defamation against the Prosecutor-Counter-Defendant (pages 232-278). The fact that the Defendant-Counter-Prosecutor filed in the file also disputes where the defendant is the Government of the Republic of Croatia, as contested the appointment of the Prosecutor-Counter-Defendant for the Director of the State Intellectual Property Office (SIPO) in 2008 (pages 378-394) is because in the meantime it was confirmed exactly what the Defendant-Counter-Prosecutor pointed out in her lawsuit dated 21.4.2008 (pages 378-379), which means that the Prosecutor-Counter-Defendant fulfilled the elements of the penal offense against official duty: abuse of office and powers by damaging directly or indirectly the State Budget of the Republic of Croatia (page 366) and giving the Minister of Science a bribe, who is a member of the Government of the Republic of Croatia who appoints the director of the SIPO. And he bought his second term of office as director of SIPO in 2008 by paying for an Audi 6 for the Minister of Science (pages 101-102, 120-124, 149, 153, 155, 307-309, 356-358, 371-373, 379, 392). The fact is that the Defendant-Counter-Prosecutor did not have access to a court in the Republic of Croatia in connection with this case (pages 388-389), and has still not received a response from the European Court of Human Rights, despite her repeated requests (pages 390-400). In relation to the “official version of the dismissal” (pages 36, 187-206), the Defendant-Counter-Prosecutor was dismissed by the Government of Croatia upon the proposal of the Prosecutor-Counter-Defendant, and not by force of the expiration of her mandate (pages 100-152), as he stated in the private penal case which was decided in favor of the Defendant-Counter-Prosecutor, when he was heard about the cause of the termination of the employment of the Defendant-Counter-Prosecutor. Additionally, in the same private penal case, the court noted that the Defendant-Counter-Prosecutor, by virtue of his official certification, confirmed that the Defendant-Counter-Prosecutor fulfilled the duties of Assistant Director at SIPO on a permanent basis (pages 100, 135, 152) and she could not, by force of expiry of her mandate, cease to work. The aforementioned, with additional documentation regarding the motion of the Defendant-Counter-Prosecutor for annulment of her dismissal in 2008 (pages 17, 33-35, 66, 72, 136, 334-335, 338, 344-355), with penal proceedings against the Prosecutor-Counter-Defendant (pages 66-67, 356-370), which is in the final stages, will certainly give a wider insight into this case. In the submission of Prosecutor-Counter-Defendant from 28 November 2018, he stated that the litigants were state officials who were appointed by the Government of the Republic of Croatia and that the Defendant-Counter-Prosecutor was appointed by the Government of the Republic of Croatia, and was also dismissed of her duties on the proposal of the Prime Minister (Ivo Sanader AN) and that all of his actions were solely based upon his position of the Director of the SIPO in accordance with his rights and obligations, were entirely untrue. 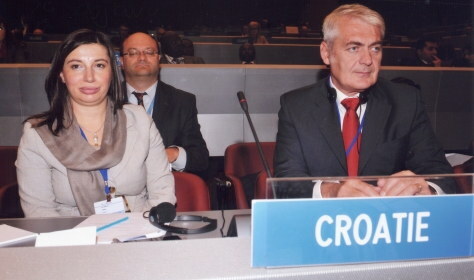 At the moment of the appointment by the Croatian Government in 2004 (OG 77/04) the Defendant-Counter-Prosecutor was a state official, but following the EU proposal, changes in the status of certain state officials in civil servants were introduced in Croatia, including the change of the status of Assistant Directors in governmental organizations such as SIPO from the status of a state officials to the status of civil servants, based on Article 151 paragraph 1 of the Civil Servants Act (OG 92/05, …) and Article 3 paragraph 1 of the Amendments to the Law on the Obligations and Rights of State Officials (OG 141/06), so that it is the solely the director of a governmental organization, here the Prosecutor-Counter-Defendant remains the only state official within SIPO. It is apparent from the Decision of the Government of the Republic of Croatia from 10 April 2008 (pages 36, 187) that the Defendant-Counter-Prosecutor was dismissed from the post of Assistant Director of SIPO on the proposal of the Prosecutor-Counter-Defendant and not, as he states, on the proposal of the Prime Minister of the Government of the Republic of Croatia. The Prosecutor-Counter-Defendant’s statement that his actions were solely based on his position of the Director of SIPO, in accordance with his rights and obligations, absolutely does not stand. The Prosecutor-Counter-Defendant announced to the European Union under the CARDS program no. 60343 (page 171), that due to the insufficient number of employees in the Department of Author and Related Rights (only two people), he announced as a permanent task the recruitment of new employees who would work under the Defendant-Counter-Prosecutor, but in practice he did just the opposite. He abolished, by unlawful procedure, secretly (page 179), without explanation, the Department of Author and Related Rights in the Statute on the Internal Organization of SIPO – NN 30/08 (pages 11, 30, 180, 185, 406-430 ), although copyright and related rights constitutes one of the two major branches of intellectual property rights (pages 160-170), which violates the compulsory provision of Article 20 Paragraph 2 of the Access to Information Act (OG 172/03) on the availability of the draft Statute on the Internal Organization of SIPO to all of the authorized people, including the Defendant-Counter-Prosecutor. He also completely ignored the recommendations of independent European experts on the need to increase employees in the Department of Author and Related Rights in the CARDS Program no. 92-022 (pages 172-178), throwing figuratively into the wind almost 2,000,000.00 Euros for the 2 CARDS programs which were paid for by the European Union. Although there were 5 Assistant Directors in SIPO (pages 197-198), of equal status, the Prosecutor-Counter-Defendant applied the legal procedure regarding the dismissal towards 4 of his assistants, described in Article 48, paragraphs 3 and 4 of the disputed Statute on the Internal Organization of SIPO (page 215). However, he did not apply the above procedure to the Defendant-Counter-Prosecutor (pages 211-214), who was the only person left without a job, while towards the other assistants whose jobs were also abolished; he offered them other corresponding jobs. The Prosecutor-Counter-Defendant not only discriminated against the Defendant-Counter-Prosecutor in relation to the other assistants in the dismissal procedure, but was extremely deceitful towards her, approving her vacation from 14-18.4.2008 (page 186), and secretly before The Government of the Republic of Croatia, based on his proposal of 8.4.2008, obtained her retroactive dismissal on 10.4.2008 (pages 36, 187). She was removed from SIPO on 18.4.2008, and had no place to return to (at SIPO) during the pinnacle of her preparation for The European Congress on the Public Lending Rights, which should have been held in Croatia (but the Prosecutor-Counter-Defendant cancelled it) for the purpose of financial aid to writers and the establishment of a new right, the public lending right, based on Directive 92/100/EEC (pages 181-183, 279-294, 299-305, 310-328, 336-337). The public lending right was solely researched and coordinated by the Defendant-Counter-Prosecutor on the state level, and SIPO was the coordinator based on the document of the Government of the Republic of Croatia called “National Strategy for the Development of the Intellectual Property System of the Republic of Croatia 2005 -2010″ (pages 300-301). The Prosecutor-Counter-Defendant has discriminated against the Defendant-Counter-Prosecutor not only regarding equal status with the other assistant directors of the SIPO in the procedure of the dismissal, but he also discriminated against her because of her political party affiliation. A full review of the discrimination acts against the Defendant-Counter-Prosecutor are described in her electronic mail dated 4.2.2008 (pages 340-343) sent to the Prosecutor-Counter-Defendant. Also, in relation to her discrimination, the Defendant-Counter-Prosecutor also refers to her electronic message of 9.4.2008, the day before her dismissal, sent to the Prosecutor-Counter-Defendant (page 377). Also in her letter of 3.7.2008 sent to the Government of the Republic of Croatia, Ministry of Economy and the Central State Office of Administration/now the Ministry of Administration (pages 434-436). Also to her letter to Dragan Primorac dated 12.3.2009 (pages 431-432). Also according to the Press Release of the SIPO / Prosecutor-Counter-Defendant of 30.4.2012, which occurred during Zoran Milanović’s (Prime Minister) mandate, he notes that the Defendant-Counter-Prosecutor is a member of HDZ (Croatian Democratic Union) and he refused to acknowledge her demand for this Press Release (pages 374-375), and in the Memorandum of 6.2.2012 which describes the discrimination against the Defendant-Counter-Prosecutor (pages 335, 338). Following the aforementioned, it is proposed to the court, upon completion of the procedure, to dismiss the Prosecutor-Counter-Defendant’s lawsuit as unfounded, and to accept the Defendant-Counter-Prosecutor’s lawsuit, with the compensation for these civil costs.